Here’s a great way to get rid of any lingering winter colds or flus before spring begins – a spicy herbal vinegar tincture. The spicy herbs in this mixture are great for opening sinuses and clearing mucus congestion. Apple cider vinegar itself has a long history of use as a healing elixir. Being both antibiotic and antiseptic, it helps neutralize toxins in the body. Make up a batch of this herbal vinegar tincture and keep it in a cool dark place for as long as 2 years. When you’re feeling sick, pull it out and take ½ to 1 teaspoon every hour to aid your healing process. To make the herbal vinegar, mince the onion and garlic and put in a 1-pint jar. Grate the ginger and horseradish and add them to the jar. Add the mustard seeds, peppercorns and chiles. Stir them all together. Pour vinegar over the mixture to fill the jar. There should be about 1 inch of liquid space above the other ingredients. Cap with a plastic lid (since the vinegar will corrode a metal lid). Let the mixture sit for 2 weeks, shaking the bottle daily to mix the herbs and the liquid. After two weeks, strain the mixture using cheesecloth so that you can squeeze the herbs to extract all of the liquid. You’re almost done with your herbal vinegar at this point. Add the 1/3 cup of honey to help preserve your mixture. Pour into a clean bottle, and label and date it before storing it away in your cupboard. 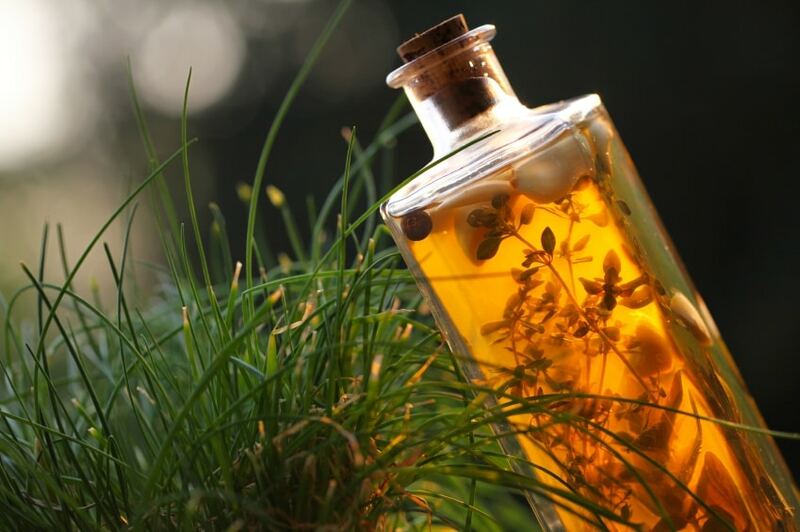 IMPORTANT: Use a plastic lid OR a piece of plastic bag under a metal lid when making an herbal vinegar. The vinegar reacts to metal. Each of the herbs used in the mixture has their own healing qualities. Indeed, garlic is antibacterial, antiviral, antiseptic, antiparasitic, antifungal, and immune-stimulating. Best used fresh and raw, bruising or crushing a glove of garlic releases allicin, the compound most responsible for its antibiotic action. Most of us are not to keen on eating raw cloves of garlic, so this vinegar gives us an alternative way to get the healing power of garlic into our bodies. John Gallagher, L.Ac. is founder of LearningHerbs and currently serves as Director of Mystery. He created the Herbal Remedy Kit and HerbMentor, and produced all the products we offer. John is a five element acupuncturist, home herbalist, musician, husband and parent.